The common skate is one of a few skate species. 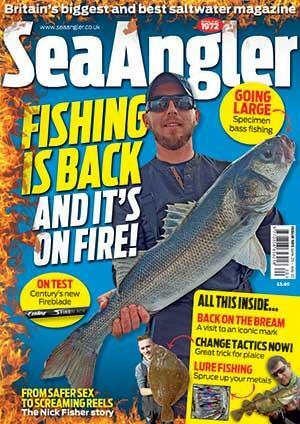 It is quite common around the whole of the British and Irish coastlines. Adult common skate prefer deeper water between 30 and 600m deep, while younger common skate can be found patrolling and feeding in shallow inshore waters. It is the largest and heaviest of the European rays, attaining lengths of almost 3m and weights of around 250lb. 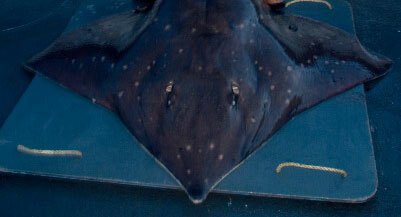 The common skate has a long snout and the leading edge of the two wings is slightly concave. The wings are rounded at the tips. Young skate are smooth-skinned, while older males have spiny backs, and older females have a few prickles on the front of the body. All skate have between 12 and 20 spines along the tail and another three spines between the dorsal fins, positioned at the end of the long tail. The backs of skate tend to be dark olive or grey with brown patches and dark spots. Skates are predatory. They feed from the sea bed to mid-water, attacking all manner of food. They eat fish mainly: other rays, spurdog, plaice, angler fish, haddock, herring and cod, but they will also eat crustaceans. Common skate lay egg capsules that measure between 15 and 25cm long. These capsules have filaments at the base of each horn to help lock the capsules to underwater weed. The newly borne skate will measure around 21cm long, from nose to tail.